On January 1, 1866, Governor Lucius C. Fairchild delivered his inaugural address and emphasized the Civil War’s impact on Wisconsin. A million of men have returned from the war, been disbanded in our midst, and resumed their former occupations… The transition from the citizen to the soldier was not half so rapid, nor half so wonderful, as has been transition from the soldier to the citizen. The governor’s speech also recognized the Wisconsin men who never returned from the Civil War. By Fairchild’s count, 10,752 Wisconsin soldiers, “about one in every eight,” had died in service to the United States (the actual number is 12,301). Tens of thousands more experienced disease or suffered serious injury, including Governor Fairchild, who served in the Union Army. Fairchild enlisted in a Wisconsin volunteer militia in 1858 and moved quickly up the ranks after the Civil War began. 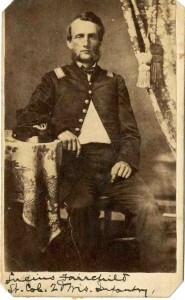 He served with the 2ndWisconsin Volunteer Infantry Regiment, part of the famed Iron Brigade, and saw action at several major battles including the Second Battle of Bull Run, Antietam, and Fredericksburg. Colonel Fairchild and the 2nd Wisconsin also fought at Gettysburg. On July 1, 1863, Gettysburg’s first day, Fairchild was shot in the upper left arm, a wound that required immediate medical attention. The attending surgeon removed Fairchild’s vest by cutting it at the left shoulder. The injured arm could not be saved and was amputated near the shoulder. This vest, now in the collections of the Wisconsin Veterans Museum, tells the story of Lucius Fairchild’s sacrifice during the Civil War. 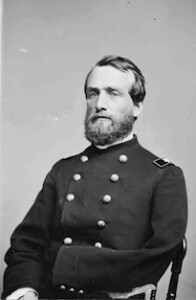 Fairchild left the military in 1863 and was appointed Secretary of State of Wisconsin before being elected governor, an office he held for three terms. He was also a charter member of the first local Grand Army of the Republic (GAR) post in Wisconsin and served as national commander of the GAR for one term. Governor Fairchild passed away in Madison, WI in 1896 at the age of 64. 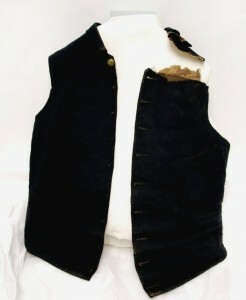 This vest is currently on display as part of the Wisconsin Veterans Museum’s latest Civil War sesquicentennial exhibit, The Last Full Measure, on exhibit until April 19, 2015.